We own two boats and each of our sailing yachts been chosen to provide an exceptional level of comfort both at sea and at anchor. Ibis V is our founding boat, and Bleu Turquoise was brought in at the end of 2014. Whilst both are geared towards seaworthiness and comfort, they are different boats and you may prefer one over the other depending on personal preference. Please take the time to read about each before making up your mind which boat you favour and drop us a line if you need more help choosing. We sail together with the two boats which can make for a lively time at anchor with a guest list of up to 10 and 2 skippers. Christmas in particular, tends to be very busy and we may even hire in an additional boat and skipper – likely my partner, Francois – to satisfy demand. Please note that the final allocation of berths is at the discretion of the Skipper. Ibis V has been home to Skipper and founder Sam Bartlett since December 2009. Ibis boasts a new teak deck, luxurious cockpit cushions and a custom galley including a freezer. 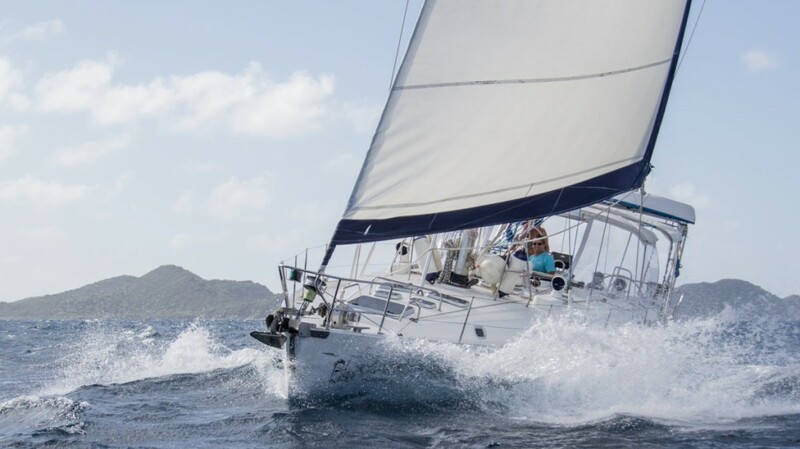 She points well into the wind and is a fast boat, loving the sailing conditions found in the Caribbean. Accommodation for guests is in two twin bunk cabins (ensuite) and two doubles, each with private bathroom. Skippered and cared for by Anthony Vlasseman, Bleu Turquoise is a capacious 50 footer with four double sized cabins for guest use. Brought into our fleet in December 2014, she has a huge cockpit area for entertaining and twin wheels make for easy access to the swim deck. Fast and comfortable under sail, and roomy at anchor, Bleu Turquoise is ideal for those needing a bit of extra space. Pedigree Ibis V was designed by French Designers, Berret-Racoupeau, active in the design of charter and racing boats for generations and built by the, then independent, French yard of Dufour. 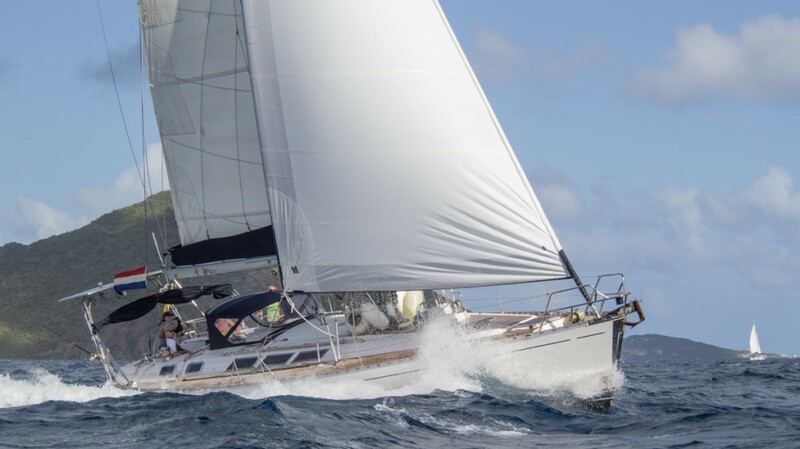 BT was designed by Bruce Farr, a renowned yacht designer actively designing for the Americas Cup teams and other racing fraternities and built by the, then independent, French yard of Beneteau. The moulds used for the Beneteau 50 hull were originally used to produce the Beneteau First 53F5 between 1990 and 1995 and these boats are still very competitive on the regatta circuits and much sought after today. Both boats have been built to exacting designs and were manufactured pre-2000. This is an important factor as the manufacturing standards for the big production yards changed at the beginning of this century to reflect their buyers’ needs for coastal cruising. Prior to this, boats of this size were classed as ocean going and built to a less compromised structural standard. BT has a race-proven hull shape. Hull Shape Ibis has a slightly shorter hull and she is shallower than BT. BT has a deep hull with a more U shape to it. The hull shape determines interior volume and sailing performance. BT has a much larger interior volume for her extra 2 feet of length, however Ibis’ sleeker shape makes her fast in the water, if a bit wetter in rough weather. Sail Area, Rig & Weight Ibis has a large sail area and taller mast. BT’s genoa track dictates a smaller headsail and the hull is heavier. Ibis has a larger sail area but her sails need to be reduced sooner in strong winds. BT can carry a larger sail area for longer. Basically Ibis is faster in lighter winds and BT in stronger! Cabins With a smaller interior volume, the cabins on Ibis are slightly smaller and she has 4 cabins (including two twins) with 3 bathrooms plus a crew cabin forward. BT has 4 large double ensuite cabins plus a crew cabin forward. BT is better for those who need a bit more cabin space and is ideal for couples. Cockpit Ibis has a single central wheel and two banquette seats to either side. She has a fold out bathing platform at the stern. BT has twin wheels in the cockpit and winches are positioned nearby. There are banquette seats to either side and a small swim platform at the back. The twin wheel steering can make BT a bit heavy on the helm when she’s under speed but access to the stern is easier. General After 5 years, Ibis has been constantly upgraded to provide a perfect platform for our sailing holidays including a custom galley and new teak decking and cockpit cushions. Recently acquired, we have a list of upgrades still to do on BT, but these are slowly being addressed. What Ibis lacks in living space, she makes up for in a turn of speed and little on-board luxuries! "Thank you for an excellent weeks adventure, it was everything I imagined it would be and a whole heap of fun with all you girls. 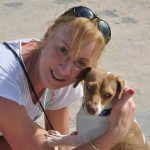 You are a great teacher and I really appreciated your patience in helping all of us adjust to life on the ocean waves. 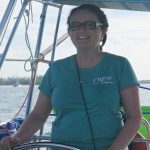 I felt I have really improved my sailing skills and you gave me a great deal of confidence, which was just what I was looking for. 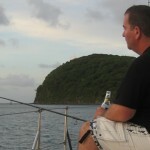 I had a great time sailing from Grenada to St Vincent. The weather and the wind were perfect and Neil was an excellent skipper. I want to do some more sailing next year so keep me informed. The boat was perfect and I enjoyed my fellow crew members. All in all a fantastic experience and look forward to future sailing trips. I am proud to wear my T shirt badged Crew! Great host and hostess + great weather = great holiday!